The 14th Annual Paper Fashion Show was a feast for the eyes. 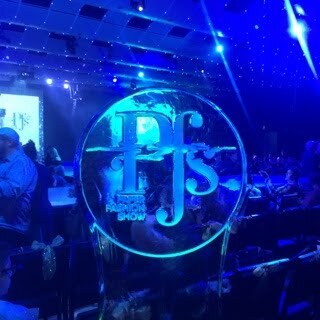 Denver Fashion Week 2018 welcomed the Paper Fashion Show for its first showcase as a part of the celebratory week, although it is the PFS's fourteenth year. The Paper Fashion Show was the best show of Denver Fashion Week, hands down. The amazing turnout, fabulous pieces and momentous party made for one of the best runway shows in Denver. Every look was created by designers with supplies provided by numerous paper mills across the country. Denver Fashion Week is "Denver’s largest fashion showcase featuring emerging designers, local boutiques, national brands, hairstylists, makeup artists and models," as stated on their site. The event draws countless fashionistas from across the country to partake in this week of fashion and style. 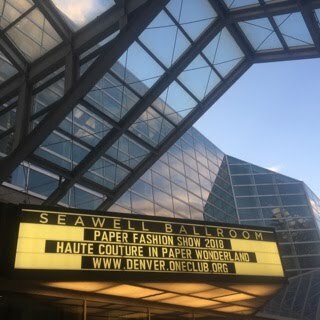 The Paper Fashion Show was part of Denver Fashion Week and took place at the stunning Seawell Ballroom in the Denver Center for the Performing Arts. The theme for this year's Paper Fashion Show was Haute Couture in Paper Wonderland. Haute Couture in Paper Wonderland was presented by The One Club for Creativity, all spear-headed by Anne Redureau. That Podcast hosts Laurie "LPiddy" Pierce and Jon Jon Lannen were invited to the festivities as members of the media. Upon entering the venue, there was a pre-show cocktail party in the lobby. It was refreshing to see how diverse fashion audiences were, some dressed to the nines, while others went casual. After the cocktail hour, the doors for the Paper Fashion Show opened. As spectators walked in, they were greeted by an illuminated floor graphic of The One Club for Creativity, gorgeous ice sculpture, red carpet, full with step-and-repeat, and, of course, an elegant runway. The pre-show was a blast. Now, it was time for the show to begin. The judges were in place, viewers in their seats and a sweet message from the President. Following the speech, the music dropped and it was lights up on the Paper Fashion Show. The first look was stunning, to say the least, with audible gasps from the audience. The show encompassed various cultures in their fashions, highlighting the continents of the Americas, Africa, Asia and Europe. The Grand Prize Winner was the Aztec Princess by Beto's Hair Studio, modeled by Itzel Gonzales, with paper provided by CTI Paper USA and Kromekote Gold. Coming in second place was Sub Rosa by Lieser-Booren Art, the model was Jessica Lieser and paper by Neenah and Stardream. Third place went to Lady of the Rain by Unsung Wolves, modeled by Amélie Hubert, with paper provided by Mohawk and Curious Collection. For more photos of the looks, please click here. LPiddy and Jon Jon of That Podcast loved the event, the after party and the entire experience. It was a stunning realization that each looks of Haute Couture in paper Wonderland was crafted out of paper. The Paper Fashion Show at Denver Fashion Week 2018 was a huge success. The Paper Fashion Show was mentioned on Episode 5 and Episode 6 of That Podcast. Along with that, there are two Behind the Scenes episodes Part I and Part II that feature the Paper Fashion Show, too. Jon Jon Lannen is the owner of Jon Jon & Company, author of the Giraffe Book Series and one half of That Podcast with LPiddy and Jon Jon. More on Jon Jon here.